Installing sub-irrigated planters (SIPs) can yield amazing results while reducing workload throughout the growing season. The self-watering or wicking beds can take a variety of shapes and forms. 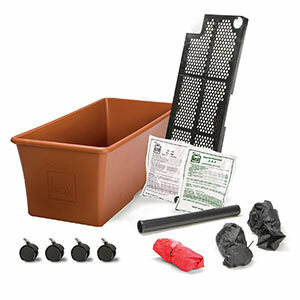 From buckets to totes to large-scale raised beds, the possibilities are endless! Of course, you may have seen fundamental differences in the basic construction of SIP garden beds. One popular technique is to construct the reservoir from corrugated, perforated drain pipes. But an alternate approach is to use a bed of gravel or even sand or perlite as the reservoir base. Which is better? More importantly, which is better for YOU? The official Albopepper approach is to use plastic pipes with slits in them to form the reservoir in my SIPs. For 5 gallon buckets, I simply nest two buckets together. But I use pipes in my SIP totes and raised beds. 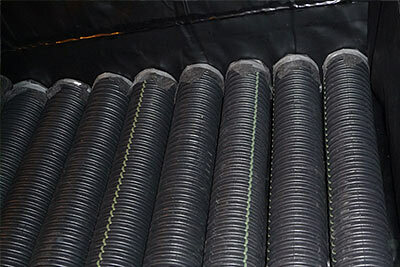 Specifically: 4 inch, corrugated, perforated drain pipe. These are made of black plastic and are sometimes found near the outdoor landscape supplies of a hardware store. In the US, I can purchase 10 foot sections from Ace, Home Depot or Lowes for $4 - $6 USD. In self-watering garden planters, the perforated drain pipes are very easy to use and are quite adaptable to a variety of sizes. Simply line the bottom of your container or bed with the pipes, allowing a little space for wicking medium (potting soil) to be squeezed in. I typically allow 1/2 inch to 1 inch max space between each pipe. The completely alternate approach is to line the bottom of your reservoir with a thick layer of gravel. Then you can place a layer of fabric over top. This fabric is intended to separate the upper planting dirt and roots from the gravel section. 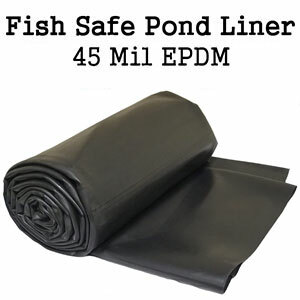 If a wicking fabric is used, then it may help to pull water upwards from the reservoir. So which is the better approach? First of all, it's worth noting that both methods have successfully grown plants. If you are dead set on a certain technique, then use it. It's your project! But if you are unsure, let me share my thoughts about gravel versus pipes. First of all, I've never used the gravel method. From what I've seen, it offers few or perhaps zero advantages over the corrugated pipe systems. GRAVEL IS MORE NATURAL? Some people feel that gravel is more natural or somehow mimics nature better than using plastic piping. But I don't buy into this thinking. 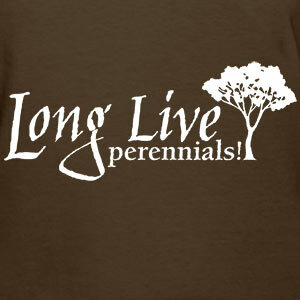 As soon as you create an impermeable layer, you separate your plants from natural biological processes. There are times when this is beneficial, but it's still a deviation from "nature's way". Using gravel in your SIP won't change that. PHYSICAL TRAITS OF GRAVEL: Gravel resists decomposition and compaction. That's about it. But it doesn't exhibit good wicking characteristics. Different gravel types may have slightly different properties. But in general, gravel does not absorb and store much water. Instead, it simply displaces water. Thus, it reduces the overall water storage capacity of an SIP system. GRAVEL IS HEAVY! Gravel's biggest disadvantage might be its weight. In smaller containers like totes, using gravel would make them unduly heavy and harder to move when needed. In rooftop systems, like garden terraces, the extra weight adds unnecessary structural load. Potting mix already gets heavy enough when it's wet. Do you really want to add more weight by including gravel? That extra weight also makes gravel much more difficult to bring into a garden site and to work with. If you are a suburbanite with only a simple car, you will not have an easy time transporting this stuff. On the other hand, it's pretty easy to load multiple drain pipes into a compact sedan. The pipes are extremely light and painless to carry. COST SAVINGS? Depending on how it is purchased, gravel can be more costly compared to an equal volume of piping. Buying small 60 pound bags will quickly chew into your budget. Getting a truck to deliver gravel might offer a better value. But it still won't save you much compared to using drain pipes. As a point of reference, a single $5 drain pipe (4" x 10 feet) can displace about 1 cubic foot of volume. FUTURE MODIFICATIONS: When you are planning an install, you might not stop to think about future removal. But what if the system must be disassembled for repair or relocation? Just imagine trying to separate out all of that gravel. Where would you place it if you ever decided to discontinue using it? Old potting mix is easy to add to garden beds, but not gravel. In a small urban lot, that discarded gravel can become a real liability. For the reasons listed above, I've never had any desire to incorporate gravel into my SIPs designs. If you are using SIP totes, you should not use gravel. Totes are brittle enough as it is. One of their biggest advantages is mobility. Don't ruin that by using gravel. For larger wicking beds and boxes, gravel might be an option. But it doesn't really become appealing until your project gets fairly large. If you require enough gravel to justify purchasing a couple of tons, then it might make sense. 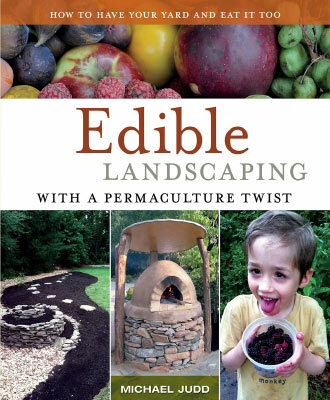 But be sure you have lots of friends who can help, some sturdy wheel barrows, and an ultra-thick pond liner. Don't even think about going thinner than 20 mil! I advise 45 mil. 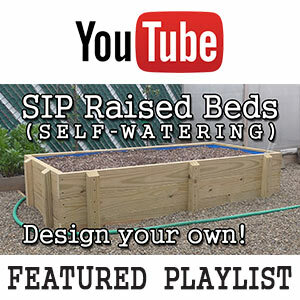 Small-scale SIP wicking beds will be easier to set up using drain pipes. Beds resting off of the ground on legs should not include gravel. The same goes for self-watering planters that will go on decks, patios, balconies and especially rooftops.